Here is where you will find headphone amps for use at home, at the office (desk top), in the studio, or in your second audio system. We carry what we feel are the best headphone amps available at various price points. We back each purchase with a 30 day money back guarantee and even offer auditions with some of our demo amps. Call us or email us to inquire about such auditions! As an audiophile, you know the fine details that go into a musical piece. The tones, rhythms and melodies should take you away from the everyday world. 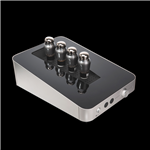 Free your mind with the best desktop headphone amp from Todd the Vinyl Junkie today. Our high-quality inventory is constantly being evaluated and updated. We stock top names such as Apex, Cayin, Exogal, Manley, Pass Labs, Luxman, Sennheiser and Questyle. You don't compromise on quality, and neither do we. 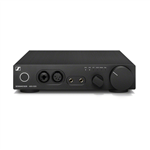 Browse through an ample assortment of tube and solid state desktop headphone amplifiers. Listening to music without a desktop headphone amp is just not done. All of our desktop headphone amplifiers come with detailed descriptions about the inputs, outputs and function availability. When you invest in fine audio equipment, you deserve to know every inch of the design. Explore a desktop headphone amp DAC to see the difference it makes on your headphones. Go as far as trying a headphone amp DAC combo. TTVJ is an audiophile who loves to share his knowledge with every customer. Ask questions about these headphone amps now because they'll become an important part of your music system.